I have invited several of my writing colleagues to share an essay in answer to this prompt: “What lingers in your memory about a specific place, perhaps a recent vacation or a place you’ve lived? 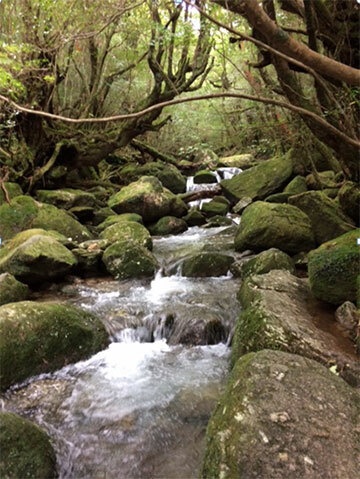 How did this place, or your travels, influence your creative process?” Caren Stelson has been to Japan many times for research and reflection. Step into Yakashima’s Moss Forest and you will be wrapped in green velvet. Let your heart slow to the splash of waterfalls and the drip of tears slipping from tips of ferns. Somewhere in the canopy of thousand-year-old cedars a monkey howls, a Japanese bush warbler whistles. Stand still and breathe in the moist air of the rainforest. Breathe out hurry and worry. I did just that while hiking in Yakashima’s World Heritage forest located on one of Japan’s most southern islands. Hiking in the Moss Forest was like drifting through a meditation. Ideas came to me, shimmered, soften, then took a seat in the back of my mind. Pristine moss protected me from the intrusion of my mental “mugwomp” that always rides on my writer’s shoulder. My personal “mugwomp” has matted fur, large vocal cords, and a discouraging vocabulary that makes me feel small, incompetent, a failure. In the Moss Forest, my “mugwomp” shrank to a thumb size. A slight breeze swept in and brushed the thing to the ground. My steps lightened. In the Moss Forest, a peacefulness sprouted in my heart. Ideas bloomed possibility. Slowly, I followed the rocky, rooted trail, pacing myself, placing one foot in front of the other. I’ve taken trails like these before. The writer’s path is always rocky and rooted, branching in every direction. Writers are left to follow a path to the summit relying on gut and instinct more than a map. That day in the Moss Forest, it didn’t matter how much my ankles twisted or my calves ached. I was fully alive, wrapped in living greenery. Now I’m back at home at my writing desk. If I close my eyes and bring back the image of walking through the velvet Moss Forest, who knows what ideas will bloom at the keyboard.